A screenshot from Google Maps of the location of 2nd Dug Hill Road. BELLEVILLE – The Quinte West OPP are warning transport truck drivers to stay off of 2nd Dug Hill Road north of Highway 2. Police say that in 2018 they responded to nine collisions involving transport trucks striking the CP Rail bridge overpass on Second Dug Hill Road south of Telephone Road. 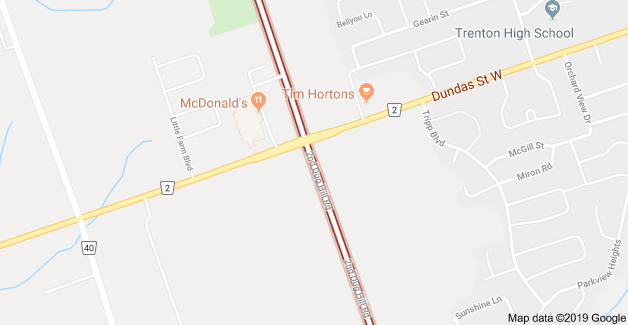 Five drivers were charged with a total of eight Ontario Highway Traffic Act offences, including careless driving, disobeying signs and failing to report an accident. Along 2nd Dug Hill Road, there are several signs prohibiting transports, but not all drivers are obeying the signs, police say.